A South Korean tanker suspected of carrying out illegal ship-to-ship oil transfers for North Korea never made the port calls in Singapore it regularly reported as its final destination, Voice of America said Tuesday. The Lunis was the first South Korean ship to be put on the U.S. Treasury Department's list of vessels suspected of carrying out illegal ship-to-ship transfers with the North last month. Records show that it steamed out of South Korean ports on 27 occasions since 2017, carrying a total of 165,400 tons of refined oil. But the Lunis has not docked in Singapore since April 9 last year, a spokesman for the Maritime and Port Authority of Singapore told VOA, and since then it left South Korea ostensibly bound for the city state on 12 occasions. Instead, the tanker was repeatedly spotted near Zhoushan Island in the East China Sea and other spots where the U.S. Treasury believes these illegal ship-to-ship transfers often take place. "As a floating gas station, the Lunis has sold oil to fishing boats and barges in those waters," the operator of the tanker said. "We reported a nearby port as its destination because of these characteristics." 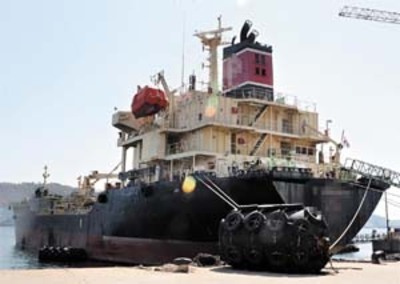 The medium-sized shipping company, which posted W18.2 billion in revenues last year, also owns the P-Pioneer, which has been detained in Busan on suspicion of transferring more than 4,300 tons of diesel oil to North Korean ships (US$1=W1,137). A government spokesman here said the company leased the P-Pioneer and Lunis to Singaporean firms and there is "no proof" that they were involved in illegal ship-to-ship transfers. Meanwhile, some 26,500 tons of North Korean coal worth about US$3 million was unloaded recently from the North Korean ship Wise Earnest, which had been detained in Indonesia since April last year on suspicion of illegal ship-to-ship transfers, and a Panamanian-flagged ship is currently traveling to Malaysia with the coal, according to VOA. It is expected to arrive around Wednesday.